On a hiking trip in Alaska in 1920, Seattle resident Lloyd Nelson used a borrowed Indian pack to carry his gear. The pack was sealskin stretched over willow sticks, and proved to be uncomfortable to say the least. He thought he could design a better one, and thought there would be a market for one among boy scouts and outdoorsmen. He designed a wooden frame that had a canvas panel stretched across it. 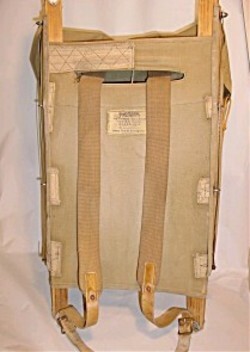 The canvas rested the weight of the pack load on the user's back, keeping the wooden frame from gouging the user's back. He got a U.S. patent on the pack, which Eric Nicholson found out is U.S. Patent 1,505,661. Thanks, Eric! He marketing the product by visiting every sporting goods store between San Diego and Seattle, and within a few years sales began to pick up. 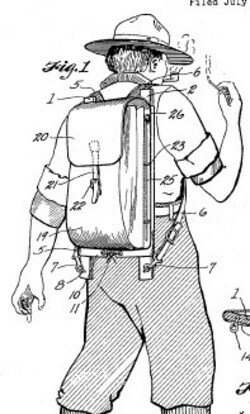 He sold his patent rights to Trager, the company making his canvas bags, and shortly after the sale, he got an order for 500 packs for the Forest Service, and another 500 unit order shortly followed. By modern standards, the pack is cruel and unusual torture, but compared to the alternatives at the time, it was a big improvement. My father-in-law carried a Trapper Nelson pack on a hike from the Hell's Canyon of the Snake River, to the town of Riggins, over the Seven Devils mountains. This was in the early forties, before WWII, and they carried canned food, an axe, a handgun, and other gear that made their pack weight extreme. I inherited his Trapper Nelson, which belongs in a museum now. I have had a Jones Tent&Awning Pioneer Trapper Nelson No.3 for over 40 years. It would have been given to me in the mid-1960's. It is complete with the removable canvas bag and the very common repair stitching to fix the rip when you pickup up the full pack by the 'handle' above the shoulder straps. I remember that these were expensive items for my parents to buy for my brother and me. When in Scouts, this was a pretty standard item for most of the boys in my troop. We used to pack these things full and hike into weekend wilderness camp areas in central B.C. Everytime I dig it out or come across it in the basement, I can still smell canvas. If this thing is only worth a few bucks, then I'll keep it for a little nostalgia.... I don't think my kids or grandchildren would know what to do with it... or be caught dead wearing it. That Trapper Nelson pack relic really belongs to a museum. History is in that pack and should be preserved. My son wants one for himself, I said that I'll think about it. I used one in the Forest Service in 1966. Once we pulled the sack off the frame (two stout wires; good design) and strapped a chainsaw on the frame instead; much nicer than setting the bar across your shoulder and walking to a fire that way. I still have a Trapper Nelson at work (USGS) but I must admit I went on my last field-geology trip with an Arc'teryx. We used Trapper Nelsons as kids. And like Reid above I still use my J T & A down "Pioneer" sleeping bag--2 1/2 lbs of down, good to below 0, never been cold in it and never too warm either. Nothing like it. 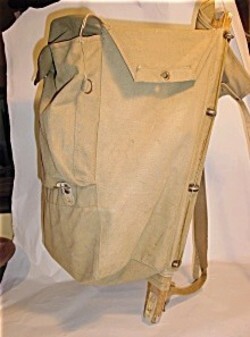 I had a Trapper Nelson Backpack that was my dad's. He got it back around the middle to late 1940's. I believe he got it for hiking in the scouts and put it to good use in the Olympic Mountains near Port Angles where he grew up. Unfortunately, I made the mistake of getting rid of it several years ago when I was helpping my mother to clean out her garage. I was 19 when my dad died from a sudden heat attack, but I have special memories of being with him on some great mountain hikes when I was a kid in the Boy Scouts back in the late 60's and early 70's. I'm very fortunate to still have two picture of him with his old Trapper Nelson backpack. These are two of my favorite pictures in my extensive collection. Boy, I sure wish I would have hung on to that old pack. From reading the other entries. it sounds like I might be able to find one like it on Ebay. It's strange how I can remember exactly how it looks and how it felt on my back even thought it been 15 to 20 years since I last saw it. It was not comfortable to wear hiking, but there is still something REALLY SPECIAL about it. If anyone has some picture of the different models from around this time period. I'd love to see them. Jbsglass, the Jones Tent & Awning (JT&A) packs were made by a company started by C.H. Jones, a sailmaker, the year after a fire leveled what was then Vancouver. I have written an illustrated brief history of the company. C.H. invited a young fellow on the east coast to join him, the last name being Lipsett. A year or so after joining C.H., Lipsett went into business for himself, competing against JT&A. It was the Edward Lipsett Co., that manufactured the Pintail model. The Pintail model is rare compared to the JT&A and the Trager packs.